Bees are tiny flying insects which are popular for their honey-making skills. While these are quite useful for making honey, these can be a major problem at times. Its bites are usually painful and the attack of a large number of bees can be all the more dangerous. While handling single bee is easy, dealing with a whole colony of the bees is difficult and can be fatal. Here are the few tips you can follow in order to get rid of the bees completely. There are many species of stinging insects such as wasps, hornets and bees. Therefore it is important to identify the species in order to use an appropriate method to get rid of them. Since all these insects look similar, it is quite difficult to differentiate between them. They can be identified on the basis of their hair, food sources and thickness. Bees appear furry all over the body whereas wasp and Hornets have small amount of the hair. Hornets and wasps prey on other insects or food wastes whereas bees make their food from flower nectar. The nest of these insects can also help in differentiating them from each other. The nest of the honey bee is found within hollow spaces such as logs, tree trunk and fence posts. The other bees such as bumblebees, carpenter bees make their nest in or near soil or into the wood. The bees have a tendency to get attracted towards human establishments such as homes, yards, vehicles etc. There are different ways to deal with the bees which mostly depends on the places in which they have made their hives. In the case of removing bees from home, you should dress in protective clothes and spray pesticides on the bee hives. Once you are sure that all bees are dead then only you should remove hives. If the hive is inside the walls then you must take the help of professionals. If bees have their nest in the ground then using chemicals can be useful to remove them. Do not use gasoline or other generic chemicals as it can position the ground which can be dangerous for the animal and plant. It is difficult to eliminate the bees from the car. You should use the safest solution in such a case. Hence, calling a professional would be best in removing bees from the car. It is not enough to remove the bees all at once as they can come once again. Removing all nests and honeycombs is the best way to prevent the bees from returning back. Therefore, make sure that there is no honeycomb or nests left behind. Another important way to prevent bees from returning is to make all the necessary repairs immediately. You should close all the cracks, gaps, or point of access to avoid bees from forming their colonies. Don’t forget to seal the areas with insulation foam, caulk or any other material. The last thing which should be kept in mind to get rid of the bees permanently is to clear the property of ideal nesting spots. Limit all the places where the bee can build a nest. Eliminate all unnecessary junks that have accumulated as they can become a perfect spot for bees to build a nest. Fill all the old rodent holes and dens in the ground. Block access to underneath structure like porches, decks and sheds. Remove all the hollowed trees and logs. The main objective of these tricks is to make sure that there are no places available for bees to make their nest. The above-mentioned methods are helpful in getting rid of the bees to a great extent. Since bee bites can be dangerous, wearing protective clothes is necessary to get rid of them. Since, there is always a danger of bees getting back into your home or attacking your family, it’s always better to leave the task to professionals. 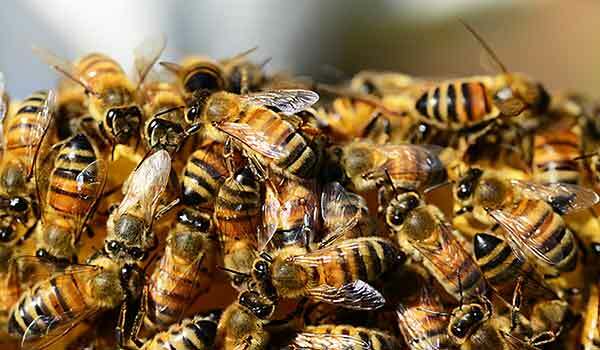 Professionals come well-equipped and are the right people to get rid of bees permanently. They also have the right chemicals and sprays along with apt clothing to carry out the procedure in a safe and efficient manner. If you are fed up of bees at home and want to get rid of them completely, you must get in touch with My Home Pest Control. It is a leading company with an expertise in bee removal services. Moreover, the company boasts of being the best and takes guarantee for their work. Just give them a call on 1800 122 695 to avail their expert services now. No matter whether it’s an outdoor, residential, commercial or industrial space, the company can help make your spaces 100% bee-free. Moreover, their services are available at a very nominal price. The staff too is highly talented and expert in their services. Same day services are also available with 24*7 availability.